Can pneumonia cause inflammation in the blood vessels? Researchers get $153,000 grant to find out. Drs. 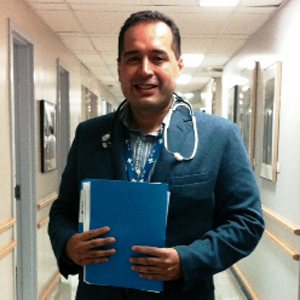 Vicente Corrales-Medina and Girish Dwivedi were awarded $153,000 from the Heart and Stroke Foundation to investigate whether pneumonia can cause inflammation in the arteries of older patients. Their team previously found that after patients over 65 had developed pneumonia, their risk of cardiovascular disease rose two- to four-fold. The biological reason for this is currently unknown. Studies in animal models suggest that pneumonia can increase inflammation of the arteries, which has been linked to a higher risk of heart disease. The research team will further investigate this possibility by comparing the artery inflammation levels in pneumonia patients over age 65 with those of patients who have not had pneumonia. This is one of five Heart and Stroke Foundation grants recently awarded to researchers at The Ottawa Hospital / uOttawa.